ARCATA – Jeane Slone learned about Arcata’s nocturnal armies of slithy toves like so many others do – the hard way, by having her car burgled the night of June 26. Lost in the theft was a one-of-a-kind, treasured kayak. She’d chain-locked it to the roof and stashed the paddle inside, but when she went out to her car at 8 a.m. the next morning, it was kayak-free. She’d had the eight-foot vessel for just a year, but knew the maker, and it’s a type which is no longer available. “It was pretty special and important to me,” she said. Slone’s daughter, Violet Crabtree, then got busy utilizing all the frightening little tools that science has made available – in this case, Craigslist. Someone who noticed the blurb was Mike Smith of McKinleyville. Several days later, on July 7, Smith noticed an abandoned kayak underneath the Hammond Bridge on the Mad River. Inside the beached boat was a crude paddle fashioned from a stop sign. “It was the ugly, ugly stop sign paddle that alerted him to the kayak a little ways up river,” Crabtree said. 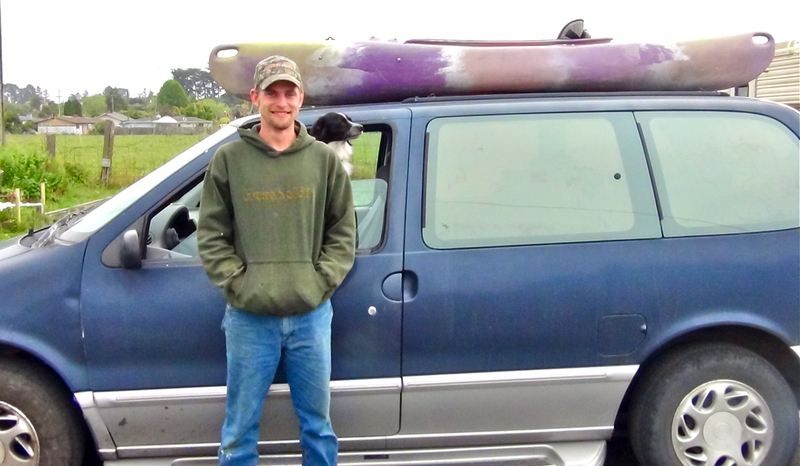 Recalling the online ad, Smith loaded the kayak into his van, then went and contacted Crabtree. On July 10, Smith and Crabtree met, and mom’s treasured kayak was back in safe hands. “I was so thrilled,” Slone said. But she was frustrated, too, by Smith’s refusal to accept a reward for his valiant kayak rescue and return. “I just want you to know that there are good people, she said he said. Smith proved to be an elusive Samaritan. Called at Sun Valley Floral Farms, the workplace he gave, personnel there said he had gone to work at Eureka’s Lost Coast Brewery. A gentleman named Mike Smith at the brewery said he didn’t know anything about the kayak rescue. A message to Smith was not returned. He might have been busy using the $50 gift certificate from Murphy’s Market that Crabtree gave him for his meritorious deed. Enigma notwithstanding, Slone affirmed Smith’s message. “He really is a wonderful guy,” she said. This entry was posted on Friday, August 3rd, 2012 at 10:05 am	and is filed under News. You can follow any responses to this entry through the RSS 2.0 feed.